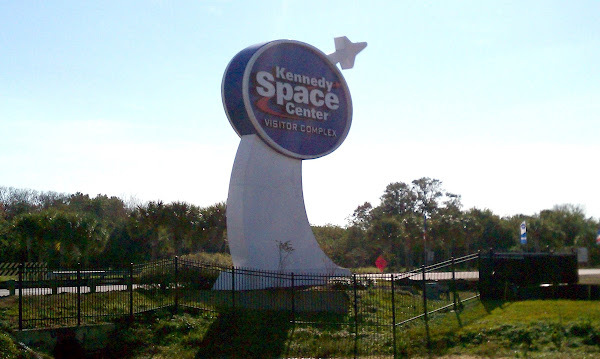 On Tuesday we visited the Kennedy Space Center. The last time we had been here was in 1993 so a lot has changed – for the better. The AAA book rates this attraction as a GEM and says to allow 5 hours – NOT! You need a full day to take everything in, plus a couple more hours to visit the Astronaut Hall of Fame (which is at a different location). The entry fee is $39 p/p (and that’s the over 55 rate) which seems a bit steep, but after our visit we both felt it was well worth the cost. Also, the entrance fee fully funds the attraction so there are no federal tax dollars spent. We would both highly recommend a visit, even if you are not so interested in rockets, the stories told are all very well presented, human oriented and doused with a good deal of humor. I’ve been interested in the space program since I was old enough to read yet there was still a lot of new info learned here. I will say that after leaving here, I felt much more optimistic that perhaps the human race does have a chance to save itself from almost certain physical and social oblivion within the next century. Elements of the current space program are striving to involve private enterprise so perhaps the greed that so threatens our fragile environmental existence currently will in some small way help preserve at least the breadth of knowledge we have gained over the previous century. Anyway, enough of that! I won’t go into all the attractions, but will mention the highlights. 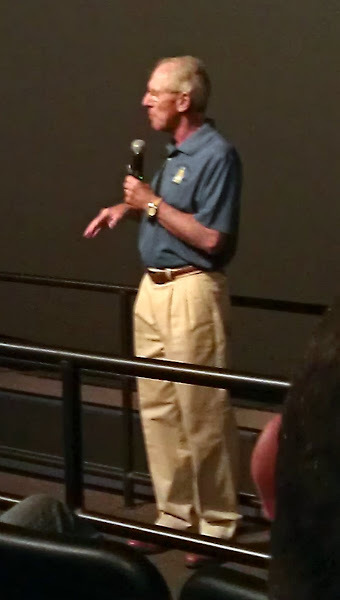 First stop was an “Astronaut Encounter” – a lecture and Q&A in one of the two IMAX theaters by Bob Springer who flew two shuttle missions (STS29/1989Discovery & STS38/1990/Atlantis). Critical info everyone wants to know, like “how the toilets work” (basically suction) are discussed. This was a very enlightening discussion spanning a breadth of topics from technical, to human survival, to politics. A free photo op with him is offered after the lecture if you are in to that sort of thing. The two IMAX shows are not to be missed. One about the Space Station and life up there and one about the Hubble Telescope, its various repairs and what it can see. Both have extensive real IMAX space footage, are in 3D and present some very interesting and thought provoking content. 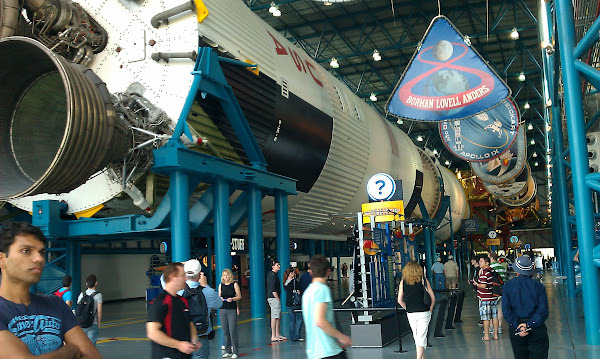 The general admission we purchased includes a tour bus ride with two stops – the launch complex 39 observation gantry and the Saturn V rocket display. Do not miss either. 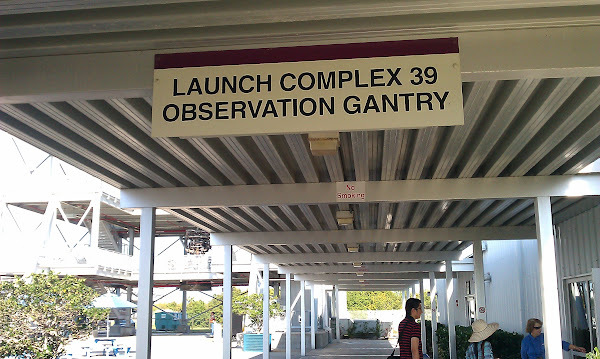 Complex 39 is where the shuttle launches used to be, but they will be re-purposed for other missions. It happened that a “crawler” was bringing a launch pad out to one of the launch areas as we arrived at the viewing area. These 1 mph behemoth “tractors” get about 42 feet/gallon of diesel and are some 131′ long and 114′ wide. 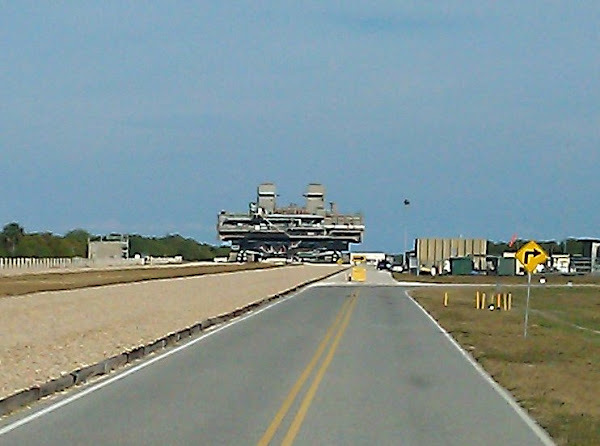 They run on a special “road bed” designed to take the massive weights involved of carrying a rocket and its launch pad out to the launch area. The last time we were here in 1993, the Saturn V rocket display was basically a rusting hulk sitting out in a parking lot. Now it has it’s own beautiful building complete with a suspension cradle so you can even walk underneath it. The stages are separated so you can see the engines and other “guts”. There are lots of informational displays concerning all manner of info including a few moon rocks. 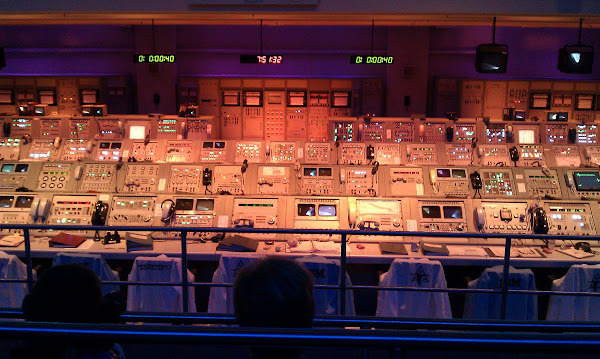 Also included in this attraction are a couple of very nicely done multimedia shows describing the Apollo moon landing missions, including (we were told) the actual complete mission command center. This attraction alone will eat up at least 3 hours and is worth every minute. 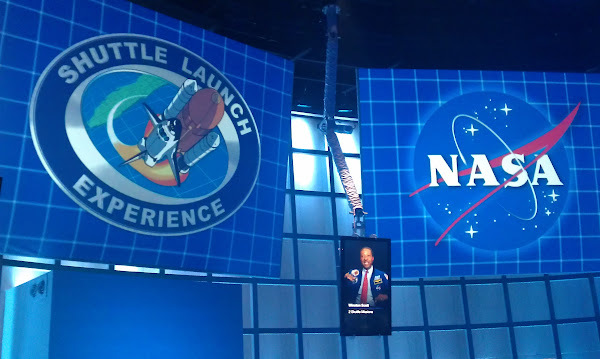 And lastly, the final must see is the Shuttle Experience simulator. This is a Disney caliber “ride” complete with advanced queue, and a very humorous pre-flight show. Don’t be to turned off by all the “warnings” about this ride, it is actually somewhat tame – they basically sit you down, flip you on your back and shake the crap out of you (literally in some cases I heard). The “capsule” holds about 50 or 60 people I would guess so is not in the least claustrophobic. The premise is that you are in a passenger module to be loaded into the shuttle cargo bay. The ride takes you thru the complete detailed launch sequence including the “sway” (I forgot the proper term) after the engines fire but before the clamps release. Of course upon launch and booster separation you don’t really feel any G’s or weightlessness, but I would imagine the vibration simulation of the launch is somewhat realistic. I was a little disappointed that they got us into low Earth orbit and then the ride ended – I was hoping for a shuttle landing too! For additional cost you can buy tours of the gigantic Vehicle Assembly Building and other parts of the Kennedy Space Center complex. We were more than happy with the basic admission though. Below is a photo album of all the photos we took on Tuesday. Click on the photo below and then click on the first of several photos that appear – this will bring up a larger photo – now just use your keyboard arrow keys or mouse to navigate thru them. The first few shots are of the “RV port” homes and the Juke Box Cafe where we had breakfast on the grounds at The Great Outdoors Resort we stayed at. Pics are Great.! Must have been an exceptional trip to the Space Cntr. The houses with the coach & garages are interesting. Looks like a nice place to live–any ideas?